Islamic extremists have started openly calling for the destruction of a controversial Muslim sect in a major escalation of sectarian conflict within British Islam, an investigation by The Independent has revealed. Members of the Ahmadiyya Community have seen a significant upsurge in threats and intimidation over the past four months, sparked by an extremist attack on two of their largest mosques in Pakistan earlier this year. Hardline Islamists in Britain have been distributing leaflets calling for the murder of AhmadiMuslims in Kingston-upon-Thames whilst mosques have been vandalised in Newham and Crawley. Preachers in south London have also been orchestrating a boycott of Ahmadi businesses and Ofcom has had to reprimand an Islamic satellite channel for repeatedly calling the sect “Wajib-ul Qatal” – an Arabic phrase used to describe those who digress from mainstream Islam that translates as “liable for death”. Community leaders say the upsurge in animosity towards Ahmadis is directly linked to violence in Pakistan where local Taliban militants have declared war on sects that they deem to be heretical such as the Ahmadis and the Shi’a. Although the Ahmadis have been targeted by extremists in the past, the combined attacks on two mosques in Lahore in May was the most brazen assault on their community yet, with 93 worshippers killed as they gathered for Friday prayers, including a number of Britons. Since the mid 1980s the Ahmadi community has been headquartered in Morden, south London, after their leaders were forced to flee Pakistan, the only country in the world that legally forbids them from declaring themselves Muslims. They claim to have 70 million adherents worldwide although detractors say the number is closer to two million. 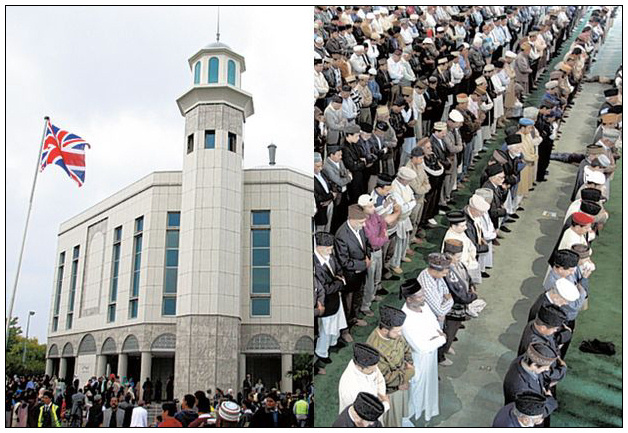 An estimated 15,000 live in Britain including their spiritual leader Hadhrat Mirza Masroor Ahmad. The Ahmadi leadership had hoped the attacks in Lahore would prompt an outpouring of sympathy among British Muslims. 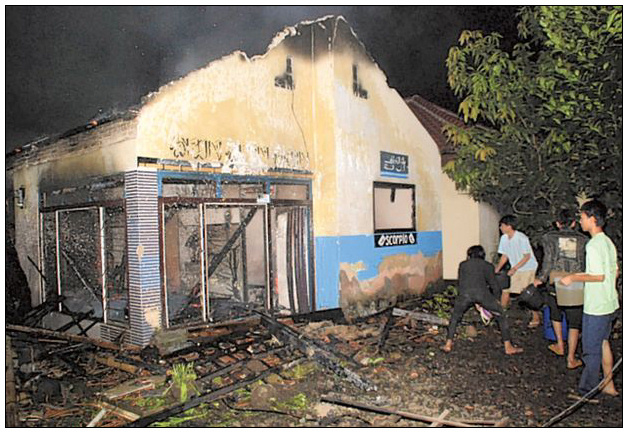 Instead, they say, it has emboldened a minority of extremists to openly target them in an upsurge in intimidation. Police in Kingston-upon-Thames have opened a hate crime investigation earlier this summer when an Ahmadi woman was handed a leaflet by a man which stated: “Kill [an Ahmadi] and the doors to heaven will be open for you.” In Tooting, meanwhile, some mainstream Sunni preachers have urged follower to boycotts Ahmadi businesses. To many orthodox Muslims, the Ahmadis are considered heretical because they believe that their 19th century founder was none other than the Mahdi – Islam’s equivalent of the messiah – and the successor to the Prophet Mohamed. Islamic satellite channels, a rapidly expanding but largely unregulated section of the broadcast media, have played an instrumental role in recent anti-Ahmadiyya campaigning. This week Ofcom criticised the Ummah Channel for a string of three programmes broadcast shortly before and after the Lahore massacre in which clerics and callers alike said Ahmadis should be killed. On 21 May the Ummah Channel broadcast a in which Islamic scholars debated the status of Ahmadis within Islam. Ahmadis were also frequently referred to as “filth” who should be avoided by mainstream Muslims. Ofcom ruled that the Ummah Channel breached broadcasting regulations with its “abusive treatment of the religious views and beliefs of members of the Ahmadiyya community”. The Ahmadis say that doctrinal opposition towards their community is being spearheaded by Khatme Nubawwat Academy, a British offshoot of a Pakistani group that is dedicated to confronting Ahmadi beliefs. The group, whose name translates to “The Finality of the Prophet”, has close connections to the Pakistani establishment and met Pakistan’s high commissioner in the UK earlier this summer. They also held a conference in Newham on 18th June in which one of their speakers claimed that the attacks on the two mosques on Lahore were an Ahmadi conspiracy. He then went on to warn that any attempt to try and change laws in Pakistan which forbid Ahmadis from calling themselves Muslims would be met with violence on a similar scale to a previous massacre of Ahmadis in 1953 in Lahore. Khatme Nubbawat preachers have also given anti-Ahmadi speeches in Tooting Islamic Centre. On the website for the group’s east London offices in Forest Gate, Ahmadis are described as “nothing but a gang of traitors, apostates and infidels”. The term Wajib-ul Qatal is not used although their preachers in Pakistan often use the term. But Mr Hayat said he believed groups like Khatme Nubawwat create an atmosphere that encourages ordinary Muslims to be hostile towards Ahmadis.